Jackson says women have a part to play in the industry's transformation. 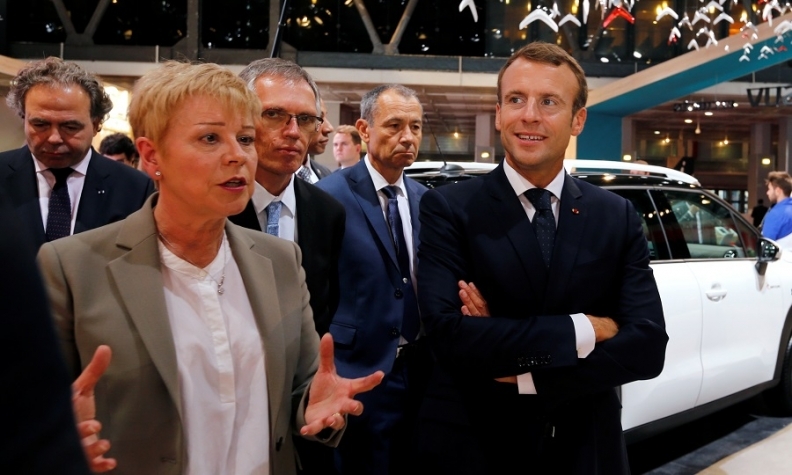 She is pictured with French President Emmanuel Macron and PSA CEO Carlos Tavares at the Paris show. To say that the automotive industry is male-dominated is an understatement. According to various studies, women make up about 15 percent of total employment — and at the executive level, that figure is even lower. That gender imbalance was the topic of an event at the Paris auto show that brought together women from different parts of the industry to offer testimony and inspiration. Speakers ranged from a teenager studying auto repair, body and paintwork to Linda Jackson, the CEO of Citroen since 2014. "The automotive world is changing dramatically," said Jackson, who has spent 40 years in the industry, starting with a short stint at Jaguar in the UK at age 18 that set her career course. "We as women have a part to play in that transformation." Speakers described the barriers to entry — and success — that they had faced. Flavie Duval, a French high school student, said she felt not just apprehension but also fear at being the only girl in her training class, which consisted of 16- to 20-year-olds. Nonetheless, she persisted and eventually won a gold medal as the best apprentice in her region. Valerie Brusseau, engineering general manager at the Renault-Nissan-Mitsubishi alliance, said her teachers, friends and family discouraged her from studying mechanical engineering, fearing she would end up working in an auto repair shop. "We have to ask what kind of image we are giving young people," Brusseau said, describing herself as a "pilot fish" to show young women how to enter the industry. More than ever, auto-sector jobs are gender-neutral, she said, noting that "a computer will not refuse to work to work with a woman because she is a woman." Saran Diakite Kaba, an executive at PSA Group in user experience and cockpit design, said it would take until the year 2186 for women to achieve parity with men on pay and advancement opportunities in the workplace, according to a 2016 study by the World Economic Forum. "We are not going to wait 170 years," she said, "We are going to accelerate the process." Kaba added that as a woman of color she had faced both sexism and racism. She participates in a program at PSA to help mentor and encourage women. Thomais Zaremba, the head of global automotive strategy at Facebook and a former Ford marketing executive, said she knew that she was joining a predominantly male field but was surprised at the behavior she experienced. "Some of the things they said to me they would not say to a man," Zaremba said, adding that she was once passed over for a promotion in favor of a less-qualified man "who needed to support his family." She described the guilt that mothers can feel in the workplace, as they struggle to find the time to care for their children while they try to work long hours to keep up with male colleagues. In the keynote speech, Jackson said women needed to have both confidence and themselves and supportive mentors to break out of their traditional roles in business, such as marketing and Human Resources. She recalled being at an event for senior managers at a company "and out of 300 people there, only three were women — and the other two were HR executives." A question she is constantly asked is "What is it like being a female leader?" Jackson said. Her answer: It’s no different than being a male leader because she is judged on her credibility, her results, and her ability to get people to buy into her vision and strategy. "When you finally get through the glass ceiling, it's a great view," Jackson said.